Now he must risk never achieving what he wants most–his father’s love. Billionaire globe-trotter Sean Worthington is stunned when his older brother suddenly abandons the Senate race in New York and walks away without a backward glance. As campaign manager, Sean’s left to handle the media feeding frenzy with no answers. Worse, their father–as usual–backs Will, the “perfect” son. Frustrated by his father’s lack of belief in him, Sean determines to finally move on and forge a unique path. But when a powerful secret is revealed, threatening everything Sean has counted on, he must wrestle with shocking truths . . . and combat the power brokers behind the scenes who have the Worthington family in their crosshairs. 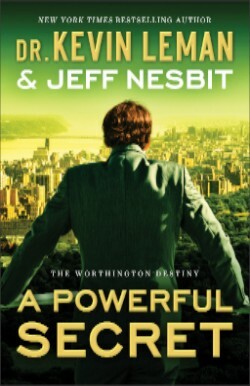 A Powerful Secret is just that, a secret that comes to surface that will change the way one of the Worthington brothers values his life. Just as Will Worthington is about to announce he is running for president, he drops out of the race, and walks away leaving his younger brother and campaign manager Sean to deal with everything involved. Now Sean can finally work to get his father’s approval, since Will was always the one that had their dad’s attention. But things end up in an uproar when secrets start coming to surface in the highly known Worthington family. This is my first book by these authors, so I wasn’t sure what to expect. The book cover doesn’t give anything away, and I don’t like reading the back of the book, I don’t want to know what is going to happen. The authors did an amazing job writing this story. I love suspense stories, and this was sure one that kept me on the edge of my seat! The characters were solid, perfectly created and well developed throughout the story. It was interesting seeing the inside a family that is heavely involved in politics. The inside life of this policital family comes to life as well as difficult situations that come up. The authors did a great job weaving together all of the diferent aspects of this story and making it a wonderful read. If you enjoy suspense and political stories, I highly recommend this one for you to read. I received this book from Revell to read and review. I was not required to write a positive review. The opinions I have expressed are my own. I am disclosing this in accordance with the Federal Trade Commission’s 16 CFR, Part 55. As Marie Carrington is on the run from her former life, she meets nice guy Jack Sloane. Jack so happens to need help decorating the new bed and breakfast he is opening, and he hires Marie. Jack’s nephew Seth wasn’t too happy with the deal, but there was nothing he could do but go with it. I love the way this book starts off, capturing my attention from the very first page. 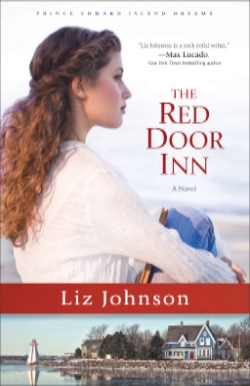 I enjoyed the way Ms. Johnson does an amazing job weaving together a sweet story of love, hope and healing in the intriguing and well created and developed characters playing out their parts in this story. It was enjoyable following Marie and Seth, they were both so adamant that they didn’t want anything to do with each other, but the longer they spent time together, the more they enjoyed each other. And it appeared Jack was just sitting back watching. I am so enjoyed following Marie and the decorations she was buying and changes she was making in decorating the end. Even changes that the men had already made and she changed again. This is why a women’s touch is needed in decorating! 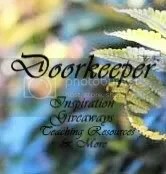 The Red Door In is a very sweet and interesting book, a book that I highly recommend! This would be a nice, light summer read, and it can be read pretty fast. Serena Jones has a passion for recovering lost and stolen art–one that’s surpassed only by her zeal to uncover the truth about who murdered her grandfather. She’s joined the FBI Art Crime Team with the secret hope that one of her cases will lead to his killer. Now, despite her mother’s pleas to do something safer–like get married–Serena’s determined to catch thieves and black market traders. When a local museum discovers an irreplaceable Monet missing, Serena leaps into action–and a whole heap of trouble. 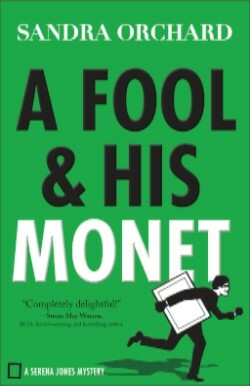 A Fool and His Monet is a pretty light mystery read. Serena Jones was high on the trail of a missing Monet from a local museum, which leads her into a whole lot of trouble. The clue just didn’t make sense, and didn’t pan out. But how about Aunt Martha’s mafia theory? I loved this lady! She was such a busybody that she wanted to know everything Serena was doing to try and catch the criminal. Aunt Martha was the best part of this story. Without her, I’m afraid I would have lost interest early on. I love Sandra Orchard books, but this one is not one of my favorites. And I just can’t put my finger on why. If you enjoy a nice light cozy mystery, you will enjoy this interesting story. And it is a pretty quick read as well. This is a book I can recommend, its enjoyable enough to keep your attention throughout the book, and you will love Aunt Martha! I received this book from Revell to read and review. I was not required to write a positive review. The opinions I have expressed are my own. I am disclosing this in accordance with the Federal Trade Commission’s 16 CFR, Part 55. I wanted to present the character of a bishop that best represented this man I’d grown to admire. So when it was time to create a proposal for a new series, I suggested ‘The Bishop’s Family,’ staring David Stoltzfus who was loosely based on this particular bishop. As Katrina Stoltzfus deals with the accident that takes the life of her mother, she is pretty much stuck in life with taking care of the rest of her family. When Katrina’s dad made a decision to send her to a neighbor lady to help her, she feels she begins living again. Especially when Andy Miller shows up helping the same neighbor. Suzanne Woods Fisher has a special talent of writing the most awesome Amish fiction. She is truly one of my favorite authors. And I thoroughly enjoyed this latest book from Ms. Fisher! Not only was there tension and heartbreak from the buggy accident, there are so many secrets lurking around in this book that you will sure having you wondering what was going one. I received this book from Celebration Lit Tours to read and review. I was not required to write a positive review. The opinions I have expressed are my own. I am disclosing this in accordance with the Federal Trade Commission’s 16 CFR, Part 55. I’m not sure what I was expecting when I signed up to review this book, but I am so glad I had the honor to read and write a review. First of all, this devotional is absolutely beautiful, inside and out. It is hardcover, very high quality paper, and the devotions are wonderful, each one reflecting on a special quilt and its meaning in author, Ramona Richard’s life. I love all of the pictures of the quilts. My grandmother was an avid quilter, not having all of the matching quilting materials and supplies that are available today. She matched what ever fabric she had on hand, making beautiful quilts, some of which I still have today. As I read some of these devotions, I could relate with the author. I highly recommend this beautiful devotional, and I pray that you will enjoy it as much as I did! I received this book from Worthy Publishers to read and review. I was not required to write a positive review. The opinions I have expressed are my own. I am disclosing this in accordance with the Federal Trade Commission’s 16 CFR, Part 55. Celebration Lit presents….Charity’s Cross by MaryLu Tyndall plus Giveaway! Charity’s Cross by MaryLu Tyndall is a 328 page novel in the Christian historical fiction genre. It was published by Ransom Press and released on January 16, 2016. To purchase your own copy, click here. This book had my attention from the first sentence, that started off with a BANG! Literally. Charity Westcott has had enough of her marriage and abusive husband. Taking care of the matter sends Charity on a ship bound for Barbados, with a lot of action in between! Elias Dutton is on his way to Barbados to make sure his sister stays safe, but now he has his little mermaid to take care of as well. The meeting of these two was unusual, to say the least. MaryLu Tyndale writes another amazing story that will have you in awe for quite a while after you finish reading. I love Charity’s spunky, determined and humorous character, though she really wasn’t trying to be funny. My heart breaks for her as the dreams continue to ruin her sleep at night, dreams of the man who treated her so horribly. Her journey wasn’t the most pleasant, being the only woman on the ship, and posing as Elias’ husband in order to get a free passage as well as keep her from the other men they were sailing with. I don’t like to give away a lot of the plot, so I won’t, I will just say Charity’ Cross is a read gem to read. I love MaryLu Tyndale’s books, and each one gets better and better! Sometimes our lives are like grains of sand on the beaches draped along our shores. One minute we are out basking in the sun, surrounded by other grains just like us and then within the blink of an eye, a wave wipes out what we believed to be our forever existence, taking us out into the deep blue unknown. It’s at that moment when we close our eyes, hold our breath and reach out for the hand that saves us. God’s hand. That is my definition of life. It comes in waves. I’ve always felt a draw to the Gulf shores. This made it the perfect place for my season of rest. Through that rest I have discovered many things about life and myself. We tend to love drama and focus on things that really aren’t important. Writing was not something that as a young girl that I dreamed of. Through my battle with Papillary Thyroid Carcinoma came the opportunity for me to meet new people. Through meeting those people, I have been given many opportunities. One of those opportunities was writing. I’ll confess… I’m more of a reader. I don’t consider myself an author and I am extremely thankful for great editors. Writing has been a fun experience. I find myself thinking – at some of the craziest times- about putting different experiences into a storyline. If only my fingers could keep up with my mind as it reels out of control. The Sands Of Times Series came about on one of my beach therapy mornings. My times on the beach bring me closer to God. I feel his presence there more than I do anywhere. I love to people watch. It amazes me that God has created some fascinating people. They come in many forms, colors, personalities and weirdness – yet all come together to co-habitat on earth. All following God’s plan (whether they know it or not). If you put the people that I have met on the beach and my life experiences together, you get… The Sands of Time Series. 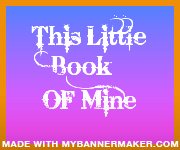 I hope each and every person that reads it gets at least one grain of sand from them to enrich their lives. The title of this book, New Beginnings, describe this book very well. Victoria was happy living in Chicago until best friend Charlie was married. It was then she started feeling lonely and ready for a change, so she makes the decision to move to Florida to be near her best friend. New place, newly married friend expecting a new baby, well things just didn’t sit well with Victoria, so when an Amish girl mentioned a room available in the Amish house she was staying, Victoria jumped at the chance. But little did she know how her life would change with her new Amish friend. New Beginnings is a very nice and refreshing story of Victoria and the new changes happening in her life. Victoria, Charlie and Rebecca were lovable characters, ones that I thoroughly enjoyed getting to know. I loved the Amish house and the calmness of the Amish life. And I appreciate that faith was woven into the life of the characters. Victoria’s journey was very heartwarming, and I can’t wait for book two in this series. Maybe there will be romance in the picture for Victoria? Pamela Jo is giving away a special beach bag, including a Kindle fire tailored for your special day of relaxing at the beach. Casey Cox is coming close to finding her fathers killer when she finds her good friend murdered. And she is afraid the same person who murdered her father has struck again. If I Run is fast pace thriller from author Terri Blackstock. Casey has no choice but to run after she finds her friends, because her DNA is all over everything, and she knows she will be at hit for the murder. PI Dylan Roberts was hired to find Casey but it all just doesn’t make sense to him. There is no way evidence proves that Casey murdered her friend. At times this seemed like a wild goose chase because Casey was always a step ahead of anyone trying to catch up with her. She was hiding out goodtime. And not like most of Terri Blackstock’s books, this one ended living me hanging. I hope there will be a book two to follow because it doesn’t set well with me the way it ended!